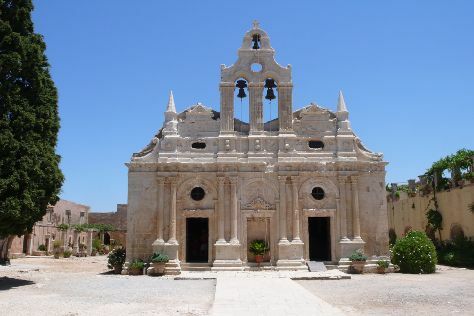 Rethymnon combines the old-fashioned charm of a small town with proximity to long sandy beaches with all the modern conveniences usually found in big tourist resorts. This unhurried little town boats a well-preserved medieval harbor, developed during the 16th-century Venetian rule. Another significant remnant of the Venetian occupation of Crete, an imposing fortress overlooks the town, its massive walls sheltering a complex of historical monuments. Below the photogenic citadel spreads a network of pedestrian-friendly streets, strewn with Byzantine churches and domed mosques built during the Ottoman era. Venture outside Rethymnon to discover dramatic gorges, remote monasteries, and ancient villages clinging precariously to Crete's picturesque coastline. Rethymnon is in Rethymnon Prefecture. Arrange all the small, but important details of your Rethymnon trip itinerary using our Greece tour itinerary planner . A growing number of visitors to Rethymnon choose to stay in one of the surrounding villages, where air-conditioned rooms near well-developed beaches cost considerably less than in the city itself. The elegant guesthouses just outside town provide a quiet night's sleep, as well as quick access to good shopping and dining options. If you prefer to stay in the thick of things, book a room near the city's Venetian port, a lively area that's just a walk away from the center's major attractions.